Popular alternative stand-up comedian Mark Thomas returns to The Point next month with a topical show that might resonate with Eastleigh folk as they weigh up the latest incarnation of the local plan. 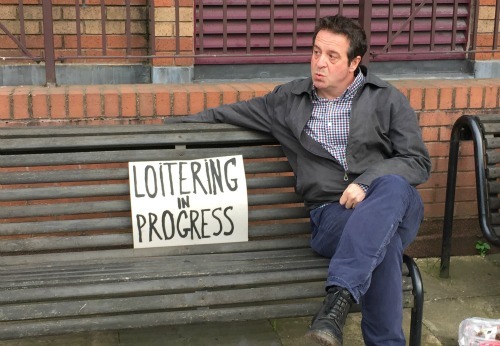 Fondly referred to by the Metropolitan Police as ‘general rabble-rouser’ and ‘alleged comedian’, Mark Thomas has found time over the last year in between his endless touring in both the UK and New Zealand to create yet another thought provoking show. Trespass, Mark’s once again total sell-out Fringe 2015 show, carries on from where his previous show 100 Acts of Minor Dissent left off. Combining his usual mix of theatre, stand up, activism, a dash of journalism and dollop of mayhem, Mark takes a fair aim at the sell-off of public communal land-from playing fields to public rights of way to private developers and corporations. Mark’s previous solo tours have sold out everywhere including The Point and have snapped up awards and nominations even earning commissions to become their very own Radio 4 series. He’s won a Herald Angel award, the Amnesty International Freedom of Expression award and two Scotsman Fringe Firsts, and took his latest show Cuckooed to tour Australia and New Zealand in spring 2015, and then New York this November. Mark Thomas : Trespass Work in Progress from arts-news on Vimeo. Interesting venue to have a show that ‘takes a fair aim at the sell-off of public communal land-from playing fields to public rights of way’, given that ‘The Point’ keeps stealing public communal land and cutting down local histroic trees in the name of entertainment.! !